The horrible Spiders are finally here. Yup, these critters from the 5th Dimension will eat your face. They'll eat your cat. Heck, they'll eat your Mecks! This Injurius Games supplement features a new squad you can use in standard or tournament play - one year of playtesting has satisfied our playtesters that this force is well balanced for face-eating enjoyment. They are in our dimension as a result of Orx tampering where they should not have, and now that they have had a taste, they're never going back. Spiders are fast. Their 8 legs give them stability and climbing power. Their ability to mutate rapidly makes them the equal of their technologically advanced enemies. 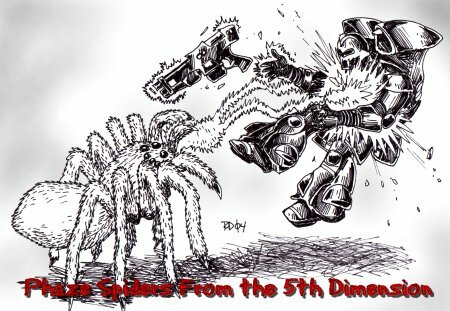 To the Spiders, even the Orx seem modern. Their powerful melee ability makes up for the short range of their ranged attacks. Spider Clutches are more flexible than any squad seen before. 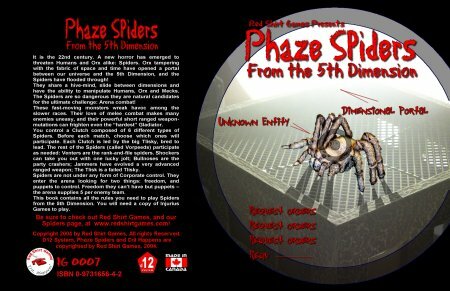 The owning player has the choice of any combination of up to 5 Vorpeeds, the medium-sized spiders, to be chosen before each battle, plus the Tlisky - the Large spider. This way, the Spider player can customize the clutch for each opponent, for each situation. Spiders have Damage Reduction, the better to stop those bipedals from hurting them. And they can cause Mecks to break down with their hypersonic Shrill attack. They can spit webs of acid, generate electric shocks, and short out your nervous system. Spiders can eat your fallen comrades and prevent them from surviving the post-game crit roll. Spiders are just plain mean. That's why so many Injurius Games players love them... and hate them! 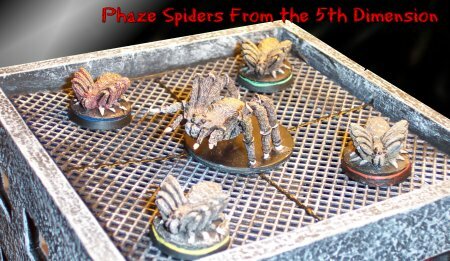 So head on over to our Store, and pick up a copy of the Spiders book and a pack of minis - you'll thank us later. The usual free stuff is available on our Downloads page - Unit Record Sheets and counters. Copyright 2007, Red Shirt Games, All Rights Reserved.